Responsiveness is one of the key factors for ranking your webpages on top of search engines. For this reason, it’s crucial to ensure that your website’s theme is responsive so that it can fit on any screen out there. Don’t worry as I’ve collected some nice responsive WordPress themes in this blog post. Just keep going on through the post. Sensei. This a well responsive WordPress theme that means that the theme can be used in any screen sizes such mobile, tablet PC or laptop. There are several custom layouts in this theme so that you can use them as per your choice at any time. Also, the slide bar option of this theme has given it additional feature to attract the audience. If you wanna monetize the theme with AdSense, then you won’t have worry anymore. The reason is that the theme has AdSense manager which is beneficial to any AdSense publisher. Overall, the theme is a nice one when it comes to using on WordPress blog or website. Belaina. I don’t wanna say anything about this a bit different theme, You had better explore it with your curiosity. I hope that you’ll find it very much engaging. What I can say is that this is one of the best SEO WordPress themes. Teddy. This theme is perfect for selling the products for babies. It’s WooCommerce supported, so you won’t have to worry about the sale of your products from your site. Dulcet. I don’t know how much attraction you’re getting with my choices. I love the simplicity and for this reason, I’ve picked simple WordPress themes here on this list of great themes. This time, it’s all the same. Dulcet is also a simple, yet powerful theme for any WordPress site that’s intending to publish blog posts. Fassion Gaze. The theme is for any fashion blog or website. You can blog and sell different fashion items using this theme. So, the multi-purpose feature of this theme is very effective in using it on a blog or site that deals with fashion items. Summit. 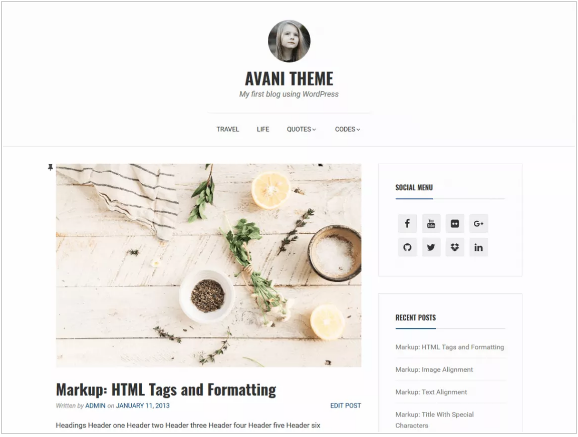 If you’re an artist who can craft something like graphic design or similar kind of thing, then you can use this theme for your blog. The nice layout of the theme will make your audience understand that you’re really a nice worker who could give them stunning things with your art. Cafe and Restaurant. This theme is for showcasing your cafe and restaurant business. So, the name is enough to know the theme’s sole purpose. Avani. Avani is the best choice for personal blogging. Its sleek design will surely make your blog’s readers happy. They will find their sweet place on your blog because they’ll find the clean layout throughout the blog. But this is possible only when you’re using this great theme. Business. A better business site that can showcase your service means you’re gonna get more and more leads with it. A theme plays an important role in building a business site. So, you can see that importance of a professional looking theme. Here is a theme, Business, that can make your business blog or website an outstanding looking one with its great touch. BitNews. The news sites are getting much popularity nowadays due to the great demand of real-time news. Because of this, you see that many theme developers have stretched their expert hands to craft themes focusing on news in mind. BitNews is kind of a theme that’s perfect for displaying news on it. Interna. You can showcase your work in a much better way with this theme. Yes, this theme is better for home decoration site. So, if your business is in the same domain, then you can reach to this. Durand. This is for any fashion blog and you can become sure that using this theme will make your fashion blog an extremely nice looking one. Posh. The name of the theme reveals its performance and look. Yes, the theme is really a posh one that can make your blog post too. Mechana. I can guess what the theme is all about. Yes, it’s very easy because the name of the theme gives enough idea to explore it. It’s all about servicing cars. You can showcase your great mechanical skills on your blog with this theme. The theme is very clean and at the same time well-coded. So, you have no worries about using this on your site. Elisa. Elisa is a nice choice for any personal blog. The author can be exposed on the home page of the theme. It’s a great way of focusing you more than your blog. Napoli. This theme shows different posts on different individual panels. The background of the theme is visible from the gaps between the posts. The box style theme is suitable both for blogging and news type site. So, try it for a great result which is promising with the theme. SportsLab. You can expose your sports-related items on your site and if you use SportsLab as the theme for the site, then there’s a big sale waiting for you. How can I say this? The reason is that this theme is focusing on your products which are related to sports. Also, you can blog on this nice theme as there’s the blogging option too embedded with the theme. Fleek. Sale, sale, sale!!! Another great theme for any eCommerce site that is intending to sell different kinds of products, especially the urban ones. So, go and grab this one for your site right now. How to start a self-hosted WordPress blog?